Cannot use file ‘D:\MSSQL10_50.MSSQLSERVER\MSSQL\DATA\myDatabase.mdf’ for clustered server. 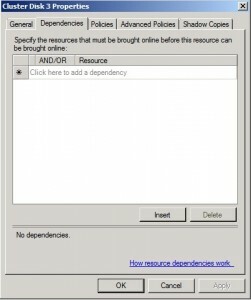 Only formatted files on which the cluster resource of the server has a dependency can be used. 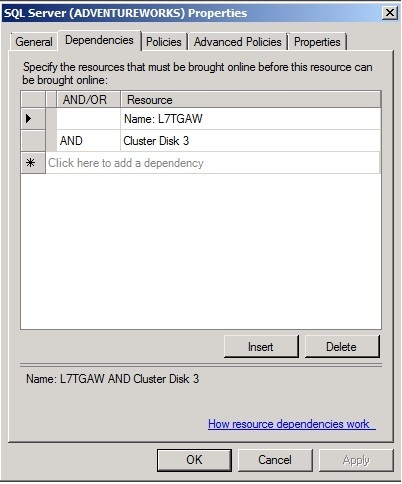 Either the disk resource containing the file is not present in the cluster group or the cluster resource of the Sql Server does not have a dependency on it. You have to love these little surprises. Here you are trying to knock out a quick little research project and BAM! You find yourself transported to a different planet where you will spend far more time than you have first, trying to make sense out of what Microsoft is trying to tell you and another “lifetime” trying to construct the query that you can “bing google” to get a clue to what is really going on. This functionality is similar to the situation with various Services that have a dependent relationship that must be established in order to function correctly. You set the relationships in the Service property. 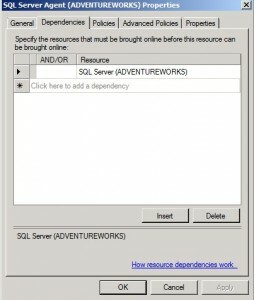 Right-click on your SQL Server resource then click Properties. 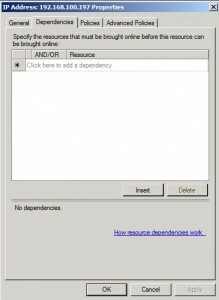 Click on the Dependencies tab. 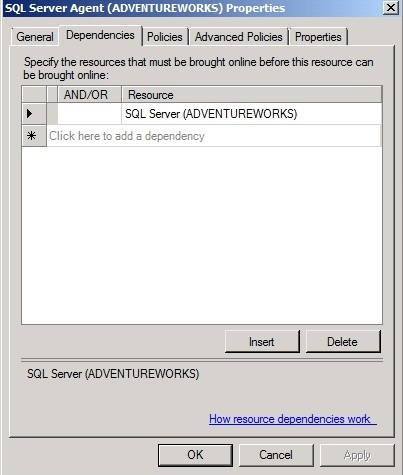 Click the Insert button to add an additional row, then select the shared disk that contains your SQL databases. 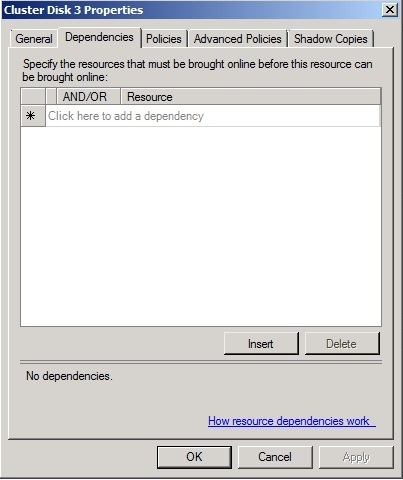 Ensure that all resources are required (there is an AND next to subsequent resources) then click OK. 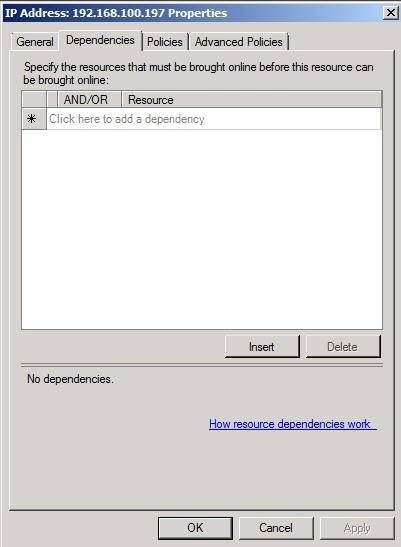 The dependencies are automatically established when you create the SQL cluster; however, if changes are made and you substitute another disk resource, then you will have to specify the new dependency. 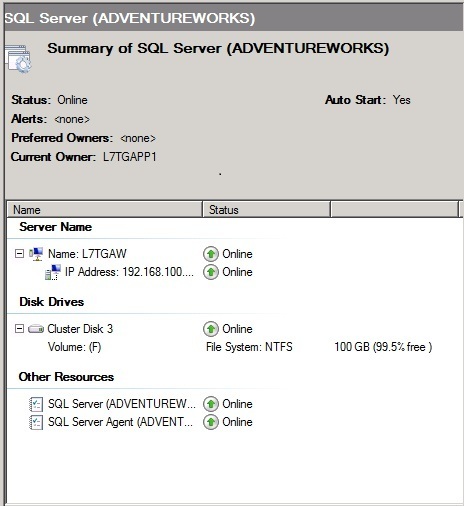 The following illustrate the resource settings for the AdventureWorksFC failover cluster. The IP Address has no dependencies. The Cluster Disk has no dependencies. 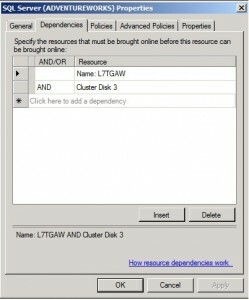 SL Server is dependent on the Cluster Name and the Disk Resource(s). 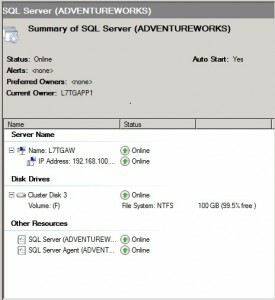 The SQL Agent is dependent on the SQL Server Engine. In retrospect, the most frustrating part of researching this problem is creating the query that you can use as a Internet search. 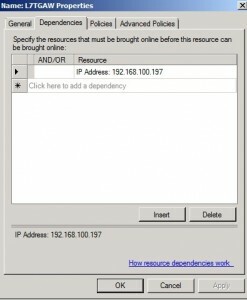 This entry was posted in Education, Rants and tagged create database failed, SQL 2008 R2, SQL Server resource sependency. Bookmark the permalink. Hey thanks for this post. I was reworking my SQL cluster’s storage, and ran into this issue during the migration process. Very clear and well written and the pictures were awesome. Saved me a lot of googeling.